[REL] SH3 Log Mod; Beta testers required. Edit: Version 1.0 corrects a bug and allows special letters like ä, ü, ö in names. The mod removes/hides your results during a patrol as good as possible. In addition, the information is hidden in the menu screens, i.e., you cannot accidently see the results in a menu screen. During a patrol you must keep notes about your sinkings,... After a patrol you start the app and enter your data (see Pic1.jpg and Pic2.jpg). After submitting the data, your claimed results are checked and (internally) compared to the true results. Depending on the difference, BdU will accept or reject the claims. The app is a perl script converted to an executable. If you want you can open the executable (e.g., with 7zip) and see what the script does. You must copy the executable to the directory where SH3 stores the save-games/careers (usually ...\Documents\SH3\data\cfg). It should be in the same directory as, e.g., GameplaySettings.cfg, main.cfg, and the Careers folder. I recommend to send a link to your desktop to easily start/access the app. 2.) Remove icons for sunken/destroyed units. Copy the files AirDestroyed.tga and ShipDestroyed.tga to ...\data\Menu\Gui\Units. 4140=Following plotted course! ;She's going down! 4141=Following plotted course! ;She's going down! 4142=Following plotted course! ;She's going down! 5.) The following two entries remove the renown value on the main campaign screen. NYGM players can see on this screen their true tonnage value (probably only critical for first patrol). If only ship names should be added (and no cargo information and losses), set 'AddText=0'. In case of 'AddText=1' always choose 'AddAsNewLine=1'. For the ship-name feature to work properly it is neccessary to use exactly the same name for the type as in the EnglishNames.cfg/GermanNames.cfg in the Sea folder of the SH3 installation. I recommend to put a copy of the EnglishNames.cfg/GermanNames.cfg into the same folder as the executable. The log executable will read this file and offer all the names in a drop-down menu (the included EnglishNames.cfg/GermanNames.cfg is from GWX). 1) This script is probably not 100% foolproof. Unreasonable input parameters may lead to messed-up output. It is not checked whether the input parameters make sense. I recommend to leave the backup-option always ticked. 2) Feel free to modify/improve the script as you wish. If you do so, please share it with others. The script is probably not very elegant, but straight-forward. If you have any question don't hesitate to ask. Thanks to sublynx and to BigWalley for testing. Last edited by LGN1; 02-26-2015 at 03:40 PM. ingenious. Does this effect the .clg files within the careers folder? Does it change how the sinkings are printed out in that file? Could you please post an example of a .clg file after sinking a ship while using this mod? Thanks. Currently the idea is to use the script/app only after a patrol. Thus, the .clg files are not touched, only the Log_X.cfg files. Without having access to the log during a patrol, it would be rather useless to edit the .clg file. One could think about having access to the log, but in this case one would have to change the script a bit and the log would only be updated after exiting the game, i.e., before exiting the game, the player could see a mixture of his entries (from previous sessions) and the true sinkings of the current session In addition, the player still had to keep a 'true/paper' log outside of SH3 (at least for the current session). I think the current solution is better. But if players would like to use it during a patrol, I might adapt the script accordingly (two new options: submit to BdU / only update log and save-game path input required). Just to make it clear: The idea currently is that the player has no in-game log during a patrol. He must make notes outside of SH3. After a patrol he 'submits' his records to the 'BdU' who checks the records and gives renown accordingly. The player can then see his notes in SH3 via: main career menu --> desk --> patrol history. There the full log with his comments can be seen (and a comparison of his claims and the confirmation of 'BdU'). Is it compatible with SH3 Commander? Many thanks for the work! My subject is War, and the pity of War. The Poetry is in the pity - Wilfred Owen. Too old to rock'n'roll, too young to die! hmm interesting will give it a try. Sounds good. So its only editing the .log files that are created after a ptrol ends and are what SH3 Commander reads from. 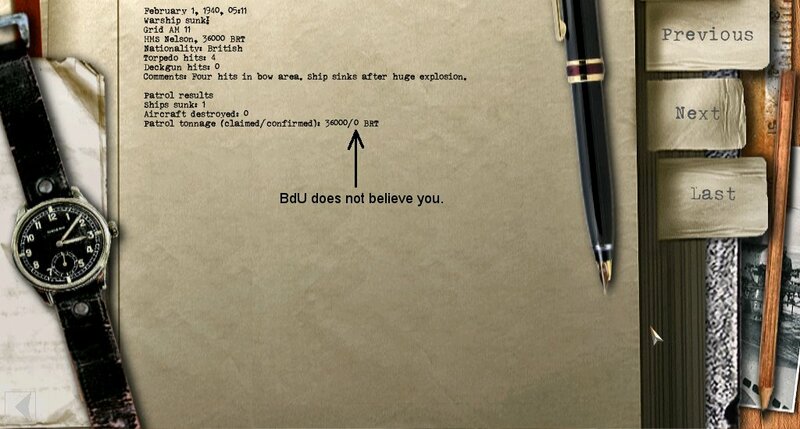 I have a question, what formula are you using to determine if BdU believes you or not? If BdU doesn't believe you, and thinks your full of ****, then do you not get renown for your sinking? Last edited by VONHARRIS; 06-20-2013 at 09:21 AM. +1: same for me. Without names in SH3COMM. I use the names actualization by SailorSteve. What might be the problem is that you did not use a type (first entry in the app) that is recognized by SH3 Commander. You should use exactly the same name as in your 'EnglishNames.cfg' in the sea folder of SH3 (or whatever language you are using). I think that SH3 Commander chooses the ship name based on this entry (in the standard SH3 log there is only this name as information, no class information). In your screenshot I can read 'Medium merchant 07'. In my 'EnglishNames.cfg' the entry is 'Medium Merchant 07' (capital M in merchant). I guess SH3 Commander makes a case-sensitive comparison and thus, does not recognize the name. To test this you can restore the old original files (if you have the backup option ticked), remove the SH3 Commander personal file, and create the log again with the 'Medium Merchant 07' name. It is a bit annoying that you have to use exactly the same name, but there is not much that I can do because it's how SH3 Commander works (Maybe I could make a dropdown menu with the entries from the 'EnglishNames.cfg', but then the app would need to know your SH3 directory path ). At the moment the equation is quite simple. If you claim less than what you actually sunk, BdU believes you (--> you get what you reported, i.e., less than what you really achieved). If you over-claim to a certain amount (I don't want to give the true number. You can find it out yourself), BdU also accepts your results (--> you get more than what you really achieved). If you over-claim even more you get less than what you actually achieved and if you completely exaggerate BdU does not believe you and you get 0 (see the screenshot above. I did not sink anything, but claimed to have sunk HMS Nelson Actually, I never left the port ). This could be improved a lot, but I think it does the main job: it forces you to pay attention to what you sink and it creates some uncertainty and excitement at the end of a patrol. It must have been the case sensitive issue as everything else was done by the book. I will try again in my next patrol and I will post the results. Fantastic. Now I understand how this works. Thanks for not sharing the exact equation either, as that would ruin the fun for everyone. Fantastic! A new reason for me to restart a career! Quite serious, by the way. I'm loving this idea.